Towable trailer types range from pop-ups, truck campers and retro teardrops… to full-sized trailers and roomy fifth-wheels. These towable RVs can be towed behind a car, pick-up, SUV or van, depending on weight considerations and towing capacities of the vehicles involved. There are many options for floor plans and the different types of towable RVs come in a wide range of prices. With toy hauler configurations, you can even bring along your favorite sports utility vehicle. Travel Trailers come in many different sizes and floorplans. Lengths range from 10 feet to 35 feet, with dry weights (without fluids or personal belongings) from 2000 to about 9,000 lbs. And prices from $10,000 to $100,000. 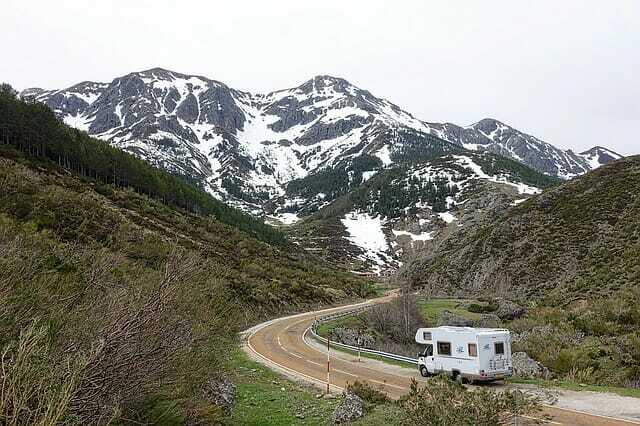 Travel trailers have their own heating, air-conditioning, electrical systems and water tanks. Smaller trailers have more compact space, usually with sofas or dinettes that make into beds. As you move up in size – full baths, kitchens, dining areas, and separate bedrooms are typical. The use of slideouts and lighter materials in these trailer types has expanded living space without adding unwanted length or weight. Many travel trailers can be towed with a properly equipped full size car, SUV or pick-up truck. Many trailers will require load distributing hitches and other special devices designed to control sway, and make for a more comfortable ride. Bottom line: This trailer type provides a lot of variety in an economical choice for Rvers. Learn more about these trailer types and towing. Fifth-wheels are so named because they have an extension on the front, which houses the bedroom, and ends in a plate that looks like a wheel (that’s where the 5th wheel part comes in). This wheel attaches to a receiving hitch (called a fifth-wheel hitch or goosewing hitch) in the bed of the full sized pick-up truck that will tow it. The arrangement effectively provides living space and increased support and stability for towing. It is very important to match up the size and weight of the 5th wheel trailer type and its associated pick-up. Fifth-wheel trailer lengths range from 21 to 40 feet. Dry weights (no fluids or personal belongings) range from 8,000 to 18,000 lbs. Generally, fifth-wheels offer plenty of room inside – often with multiple slides adding extra living space. Fifth-wheel trailers provide full kitchen area, dining area, living room, bathroom, and bedroom. Smaller or older models may have limited headroom in the bedroom area. It is pretty standard to have a VCR, and TVs. And a washer/dryer may come standard or as an option. Fifth-wheel trailer types include their own heating, air conditioning, propane supply, electrical systems, and water tanks (fresh water, grey water, black water). Many newer models have designs that provide more storage inside and out. Prices range from $15,000 to $150,000. These also are available in the toy hauler variety. Bottom line: The 5th wheel is another favorite with full timers due to the large living area (Class A motorhomes is another fulltimer favorite). Fifth-wheels are a great choice if you will be in one place for an extended period of time. There are also toy hauler configurations for both conventional travel trailers and fifth wheels ( and some motorhome varieties too). These are sometimes referred to as Sport Utility Trailers. These units have a rear compartment where you can load and carry your favorite toys, such as ATVs, motorcycles, and the like. While this means a compromise in the interior living area, some toy haulers come with convertible bed/sofa units that lift up toward the ceiling and can be lowered for use once the “toys” are taken out. Sort of like having a couch or bed in your garage, in case you need it. And they may also have connections for a TV and/or small fridge and a collapsible table. Truck Campers are also called Slide-In Campers, or Camper Shells. These trailer types attach to the back of a pick-up truck. They come in lengths from 5-21 feet, and range in price from $4000 to $30,000. They come in models that will fit almost any pickup, and like all other RV types, offer a range of choices. Some will have minimal accommodations while many include full bath and kitchen facilities, dinettes, beds, heating, air conditioning, electric, waste water and fresh water tanks, propane, and generators. Some models are even using slide-outs for more space. Bottom line: Because the camper shell is removable, these trailer types are often used by weekend RVers. When used on a 4-wheel drive equipped truck, they can be a perfect retreat for the wilderness seeker. These are cute little campers with a retro flair. The compact design allows them to be towed by very small cars (some models even by motorcycles). Compact means a sleeping area for two, and a kitchen area that is accessed from a hatch-back type lid at the rear of the trailer. The kitchen area may be a simple shelf and storage, or may include sink, stove, cooler and other options. Average body length is about 8-9 feet, and 4-6 feet wide. Teardrop type of trailers range in price from around $4000 to $10,000. Bottom line: Teardrops were first introduced in the 1930s, and have regained popularity for use on long weekends, tailgating, sporting events, camping, and long rides in the country.